“The energy transition is upon us and we have to choose to be leaders, learners or laggards,” says Hon David Caygill, Chair of the BusinessNZ Energy Council. “Both globally and in New Zealand, digitalisation has been identified as one of the biggest movers over the last four years and is now perceived as an issue of both relatively high impact and uncertainty. “For the first time the issues map shows the emergence of the ‘innovation cluster’, the internet of things, artificial intelligence, blockchain and sharing and sales platforms. This allows us to better understand the drivers behind digitalisation and their effects on the energy market. “New Zealand’s otherwise traditional energy landscape is becoming more agile as it searches for new approaches to deliver energy to the empowered consumer. “Meanwhile, decarbonisation is now an issue that energy leaders are simply getting on with. Three years after the Paris agreement, energy executives seem to be in implementation mode, no doubt assisted by stronger signals from the Government about climate change action. “The 3D trends are opening new opportunities for energy supply and use. 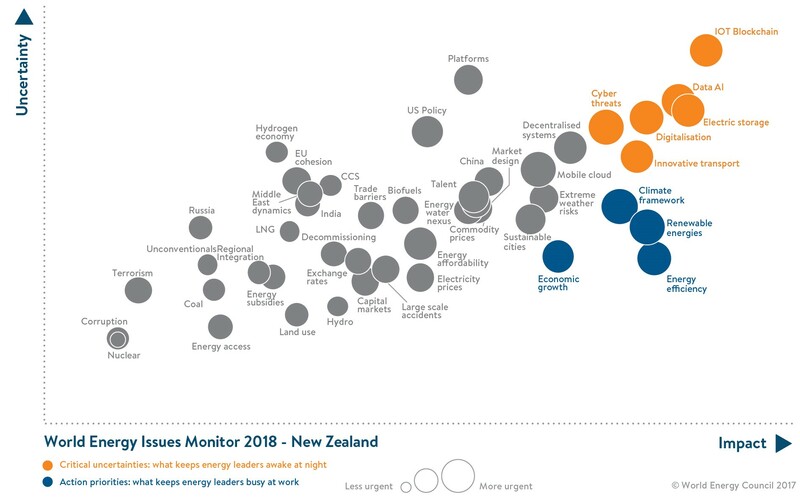 However they are also creating a challenge for New Zealand to balance energy sustainability, energy security, and energy affordability – the energy trilemma – as energy leaders and policy makers are uncertain which new technologies and business models will succeed. “Technology provides new options to access and consume energy so it is critical our energy system enables consumers to make the best choices,” Mr Caygill said. Critical uncertainties: Issues with high uncertainty and high impact (in the top-right quadrant) are the ‘critical uncertainties’ with no clear path of action which keep energy leaders most awake at night. These issues need to be part of the energy leaders’ dialogue and scenario analysis. Action priorities: The issues in the high-impact and low-uncertainty space are those which keep energy leaders most busy (bottom-right, ‘action issues’). Weak signals: The low-impact and low-uncertainty issues (bottom-left quadrant) include those of perceived lesser importance or those that are still not fully understood and in need of further investigation. The responses are translated into issue monitors with the three assessed dimensions: the impact of an issue on the energy sector – this forms the x axis; the degree of uncertainty related to its impact – this forms y axis; the urgency with which we need to address the specific issue – represented by the proportional size of the issue bubble where a larger size corresponds to a higher degree of urgency. Digitalisation will play a big role in the transition to a decentralised and decarbonised energy economy. A fundamentally new consumer relationship with energy is being forged. How do we get there? These trends will be the focus of our second Asia Pacific Energy Leaders’ Summit from 31 October to 1 November 2018 at Te Papa in Wellington, New Zealand. This year’s theme is 3D Vision – New Energy Perspectives.